The Swedish audiobook-focussed publisher and distributor Storytel has delivered another quarter of positive results, reporting a total of 577,900 subscribers (across ten countries) at end Q1, an increase of 51% on Q1 2017, and 6,000 above forecast. Streaming revenue, up 43% on Q1 2017, exceeded forecast by SEK 2 million, hitting SEK 222 million($26.5 million). 2018 has started very well, with continued strong growth in Sweden and abroad, the subscriber base grows more than three times as much as the same period last year … Several countries outperform forecasts, and the Netherlands in particular stands out with growth of over 8,000 subscribers during the quarter. 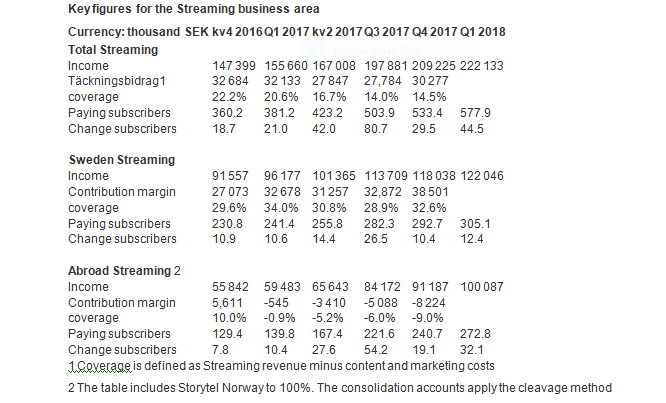 Swedish subscribers exceeded forecast by 2,100, hitting 305,100 in total, an increase of 26.4%, while “overseas” subscriptions outside Sweden jumped 95%, contributing SEK 100 million. That’s 45% of total Storytel streaming revenues, compared to 38% last year. We plan on launching in five more countries this year, starting with Turkey. and I have no reason to revise my assertion that Bulgaria and Italy will follow shortly. The Storytel Group consists of two parts, Streaming and Publishing. Streaming business area offers a subscription service for audio books and ebooks under the Storytel and Mofibo brands, currently in. The Streaming business area also includes audio book publishing and Storytel Original, which is conducted in Storyside (Sweden) and Rubinstein Audio (Netherlands) audio books. In the Publishing business area, the publishers Norstedts, Massolit, Kontentan, Telegram and Danish People’s Press (Adult), Rabén & Sjögren and B.Wahlströms (Barn & Ungdom) and Norstedts Kartor.